Ambassador Sidney S. Collie was born February 19, 1950 on one of the most undeveloped islands in the Southern Bahamas, Mayaguana. It remains today an impoverished island with a population of less than 500. Notwithstanding his humble beginnings his father, a police officer and his mother a homemaker and sometimes domestic worker, instilled in him an awareness and importance of self-preservation; fear of God and a work ethic that remains with him to this day. H.E. Collie excelled through to the highest level of education available on the island and then transferred to the capital New Providence to complete his high school education and national exams. His passion for education and service to others took him to the only college in The Bahamas at the time, the Bahamas Teachers College where he qualified as a teacher. After teaching in the public system for several years in the 1970s, Ambassador received a scholarship from government to pursue his bachelor’s degree at the University of Miami and subsequently received a Masters degree in English from Nova University in Florida. Mr. Collie would later become a headteacher in one of the largest islands in The Bahamas, Andros where he is still remembered by the families there to this day, as someone who took the time to mentor his teachers and nurture the students that came through his school. Sidney Collie’s burning desire to help those less fortunate derailed his teaching career in the early 1980’s when he participated in a protest for better working conditions for teachers in The Bahamas. He was arrested and eventually transferred to what is regarded as ‘hardship posting’ for teachers, translation, lacking some modern amenities. H.E. eventually decided to leave the teaching profession, and enrolled in the local law ‘Articleship’ programme, the route to the legal profession taken by many successful lawyers including one of the country’s former Prime Ministers. This was a rigorous legal course of study following which students were prepared for the Bar. Ambassador Collie was called to The Bahamas Bar in November of 1987 and opened a boutique law firm in 1993. He was joined by his wife attorney Mavis Johnson-Collie in 2001 and shortly thereafter established the firm Collie & Collie. The firm’s main practice areas are company/commercial, conveyancing, labour and immigration, family, civil and estate administration. His Excellency continued with the Law Articleship Programme until it was discontinued as a lecturer working to ensure that other mature law students successfully completed the course of studies. He is still fondly remembered by his students for his in depth lectures on constitution law and the Law of Equity. Though small, Collie & Collie Law Firm has gained itself a reputation as a firm for the underserved, unserved and those that are less fortunate, while at the same time providing personal service to international investors in property and business ventures. A devoted Christian, Ambassador Collie was consecrated a Minister of the Gospel at the Zion South Beach Baptist Church in New Providence, The Bahamas and recently became one of the founding ministers of Abundant Grace Church, New Providence, established by his brother Dr. Kirklyn Collie. HE Collie was appointed chairman of the Bahamas Baptist Board of Education, which has responsibility for several schools and tertiary institutions. At the convention level he also served as chairman of the constitution committee. In addition to his countless hours of service to both church ministries, Collie has served his communities through his Rotary Club and fraternity (The Boule) memberships. Ambassador Collie became actively involved in politics after joining the Free National Movement, FNM, the official opposition at the time, in the 1980s. He has served in several capacities including branch chairman, National Party vice chairman. He was humbled to serve his party with distinction during two of its most historical and monumental political feats. In 1992 when the FNM won the government for the first time since its inception in the mid-1970s, defeating the Progressive Liberal Party who had won five consecutive elections, now Ambassador Collie was the party’s national campaign coordinator. In April 2016, his party called him out of retirement and elected him as chairman of the party. He then led the organization as chairman under the leadership of Dr. Hubert A. Minnis, now Prime Minister to a resounding victory at the polls in May of 2017. Following the party’s historic win in 1992, H.E. was appointed to the Senate by the then Prime Minister, the Hon. Hubert A. Ingraham. He was elected to parliament to represent the Blue Hills Constituency, one of the largest polling districts, in 2007 and was appointed to the cabinet as Minister of Lands and Local Government the same year. In 2010, Ambassador was appointed High Commissioner to CARICOM and Latin America, a position he held until the change of government in 2012. In May of 2017, while serving as Chairman of the FNM, Ambassador Collie along with his leader Dr. Minnis and many hard working team members led the party to a 35 to 4 victory at the polls. Following the election, Collie served as a leading member of the Government’s transition team which involved advising on the selection of key policy positions, cabinet and senator appointments as well as numerous governing board appointments. Ambassador Collie was appointed Ambassador to the United States of America, Permanent Representative to the Organization of American States, (OAS) and non-resident Ambassador to Mexico, Columbia and Malaysia 1, October 2017. 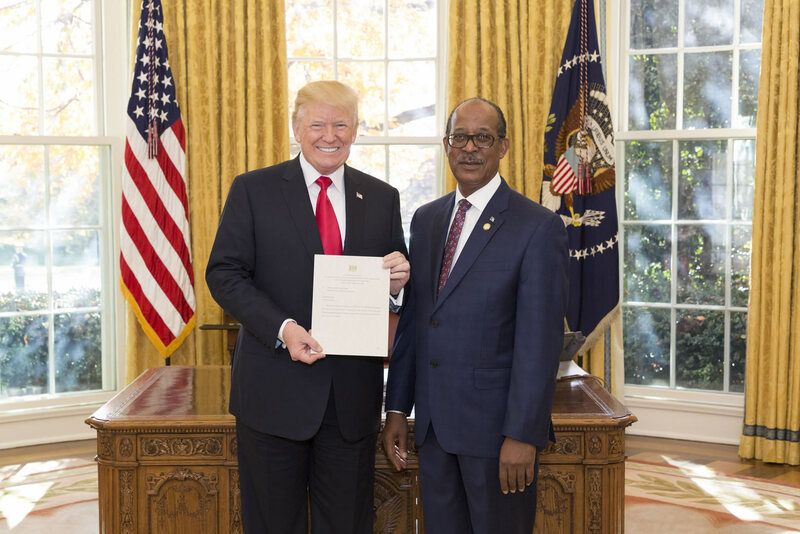 He presented his credentials to the OAS on 15th November 2017 and to the President of the United States of America, Donald Trump on 29th November 2017. Ambassador Collie is regarded as a humble and quiet individual who prefers the comfort of his family room with his family, watching any sporting event or cable news. He is a prolific reader and writer and has authored several books and articles published and unpublished, the most popular of which is, “Island Breezes” a collection of poems. After visiting HE’s home in the 1990s, former International President of the Alpha Kappa Alpha Sorority Inc. Mary Shy Scott, (deceased) ensured that “Island Breezes” was featured in one of the Ivy Leafs Magazine of The Alpha Kappa Alpha Sorority Inc. Ambassador is the father of six children and is married to Mavis Johnson-Collie.